Hope you had a good new year. My archiving continues. I called this my "Five of Kinds" for my "52 Pick Up" series of reviews. I reviewed the fifth issue of three different comics. Seemed like fun at the time. Plus I thought it was a quicker way to write reviews (as the intro below shows). Originally published January 28, 2012. Edited for clarity. Sorry to keep you waiting as we struggle to post and create new material amidst jobs and other responsibilities. All of the New 52 titles have hit the issue #5 mark. I have some books I haven’t reviewed up to this point that I want to review in bulk. For now, let’s review some books I’ve touched on in past weeks. I'm starting to think Ivan Reis is the successor to Alan Davis. Other than that, my opinion hasn't changed about this book since my first review. If anything, I'm more impressed with its progression, along with the subtle reveal of how Atlantis sank, which was not a flashback. I'm more convinced than ever now that there are two kinds of Geoff Johns. More on that in a bit. I'm glad the Aquaman-is-a-joke subplot is being downplayed more and more. 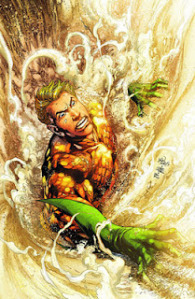 Again I have to say it (hopefully more clearly this time): In the real world, I see why there are Aquaman jokes. But in a world where superheroes acually exist, what would make Aquaman anymore an object of ridicule than a flying man in a cape and tights (especially the tights he's wearing in this souped up new universe)? I see why Rich Johnston compares this one to a Vertigo comic. This one messed with all the reader's heads. It takes a special writer of a character that has to live on as a property to give you a story with a genuine cliffhanger that makes you wonder what the hell happened and what's next? And whereas Tony Daniel's Detective Comics seemed to cheat at the end of the last story line with last minute revelations, it feels like the next issue of Batman will have some genuine surprises and reveals. No spoilers here (the book came out last week anyways) except to say it's good to read a story that takes Batman out of his element and makes him lose control. Here, he's more human and less of an omnipresent science God. Hats off to Scott Snyder. 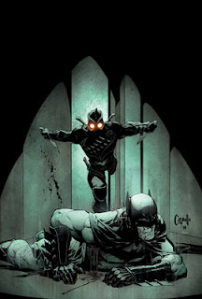 Plus Greg Capullo continues to produce compelling art and some of the best covers I've seen for The New 52. I just might have to collect this story once it's done, which would make it the first Batman collection I've picked up since the first Mad Love trade came out. As mentioned above, there are two Geoff Johns. 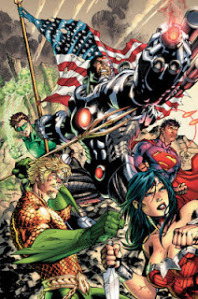 The first writes fun books like Aquaman and builds a reputation on books like JSA. The other Geoff Johns creates pointless event comics like Infinite Crisis and Flashpoint when many wish he wouldn't. And the only reason they sell is because big name artists like Jim Lee are on them. Justice League is another attempt to write something "big" like a blockbuster film. Darkseid beats the League but doesn't kill them because the heroes have to yell at each other some more. Stuff happens because it has to, or because Jim Lee is actually producing pages. I hope someone's having fun reading the book, but I can't see why anyone would. I'll be dropping this title in the hopes that Johns takes the hint and moves away from stuff like this. It's another boycott idea that is likely futile, but when I see Batman make a big unmasking to Green Lantern--in the open streets, where anyone can get a picture, in a world that allegedly hates super heroes and will shoot them on sight (which makes no sense except that it's the kind of thing that happens in the lesser comic book movies) I can safely say that there's nothing else I get out of this series.